This combination hotel and travel center owner is misunderstood, undervalued, and an ideal real estate investment to make today. Real estate investments, particularly equity REITs -- or real estate investment trusts -- make for an excellent source of steady dividends. But that's not all they do: The best REITs can also act as a source of balance in your portfolio, since they generally deliver better returns than other stocks during a bear market. Furthermore, they're often one of the few asset classes investors tend to increase their investments in during downturns. So whether you're looking to build up a hedge in your portfolio to protect against periods of weak stock returns, or looking for a solid, high-yield investment, real estate stocks should be part of your equation. There's one that I think stands out from the rest as being undervalued and maybe a bit misunderstood: Hospitality Properties Trust (NASDAQ:HPT). 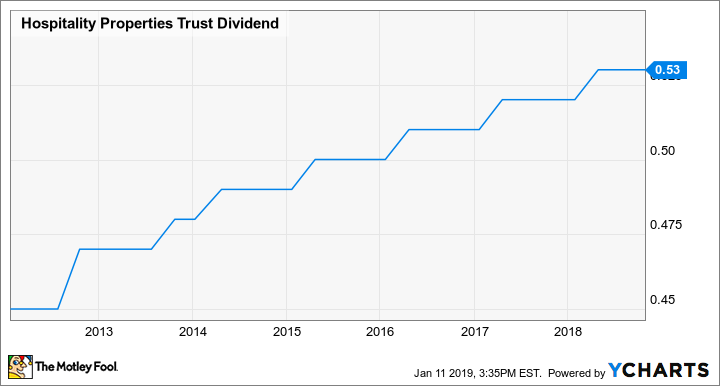 In short, a combination of factors has it trading for a single-digit valuation and pushed its dividend yield above 8% at recent prices. But with solid management and an excellent portfolio of properties to monetize, investors would do well to buy it now and profit from Mr. Market's messed-up expectations. While most REITs tend to specialize on one type of real estate, Hospitality Properties Trust is a bit of a hybrid. About two-thirds of its business is hotels, primarily mid-market hotels that generate a solid mix of both business and holiday/vacation revenues, while the other one-third comes from travel centers off major highways, primarily Petro and TravelCenters of America, two of the best-known brands in the space. Image source: Hospitality Properties Trust. One of the potential risks of being a hotel owner is the exposure to the cyclical nature of the economy. Discretionary spending such as pleasure travel and vacations is one of the first things people cut back on during a weak economy. And while the hotel brands it owns offer some built-in protection from that, since they attract a mix of both business travelers and vacationers, investors have become more leery of stocks with a lot of exposure to an economic downturn. This is one of the things that's nice about the company's ownership of so many travel centers. People tend to drive more and fly less during weak economies, so while its hotel business could face some cyclical weakness, its travel center business could help offset that to some extent during an economic downturn. Hospitality Partners Trust has seen its normalized funds from operations -- or FFO, a better measure of earnings for REITs than GAAP net income -- decline a bit over the past year, while long-term debt is up 30% to $4.1 billion since the beginning of 2017. Investors haven't been pleased to see a REIT add more debt without also growing profits and cash flows. Add in the macroeconomic concerns that the near term could get bumpy if the economy does turn south, and you have the perfect storm for the sell-off we have seen. But I think the knee-jerk reaction to these things is both short-sighted and likely to prove wrong over the long term. Don't get me wrong: There is some near-term risk that the company's results could deteriorate if the strong economic growth we have experienced recently were to slow or even stall. But when you take a closer look at what management is doing, I believe it will result in market-beating returns over the long term. The company has recently accelerated renovation spending both in its hotels and its travel centers. There's a double-edged sword downside impact when renovating a hotel. First is the obvious loss of revenue from hotel rooms that aren't available, but renovation efforts also hurt revPAR -- revenue per available room -- for all the rooms at a hotel undergoing a renovation. On the third-quarter earnings call, CEO John Murray said revenue per available room fell nearly 1% on a comparable basis at hotels undergoing remodeling. In other words, a renovating hotel both has fewer rooms to rent, and generally gets less money for the ones it has available as compared to a comparable hotel not undergoing renovations. In time, all of the spending on improving its properties should pay off with higher occupancy rates, higher revPAR, and increased cash flows. But in the short term, it is putting some downward pressure on Hospitality Trust Partners' results. And that's almost entirely what Mr. Market seems to be focusing on: the short term. If the economy were to weaken in the near term and take a bite out of hotel bookings, the combination of increased debt, ongoing renovation expenses, and further reductions in cash flows could weigh heavily on Hospitality Partners Trust. But I remain firmly convinced that even this short-term risk is worth taking on for the long-term potential. HPT Dividend data by YCharts. Furthermore, it already has the cash on hand -- and allocated -- to fund about two-thirds of the $104 million in renovations it has committed to. And it's incredibly cheap, trading for a paltry 7.5 times trailing FFO. With a high yield that's secure, a long-term plan to increase future profits, and a dirt-cheap valuation, Hospitality Partners Trust is too good to pass up. Furthermore, with so much risk already priced in, it's likely to do what REITs do best: Outperform during the next economic downturn, while delivering steady income throughout the economic cycle. Check out the latest Hospitality Partners Trust earnings call transcript.